A new bill proposing to extend policemen's rights, including those concerning the use of weapons, has provoked major disagreements among Russian public figures and rights activists. While its authors believe that extending police authority is necessary for defending the rights of fellow policemen, critics worry that if the law is adopted it will legitimize police brutality and may be used to crack down violently on protests. 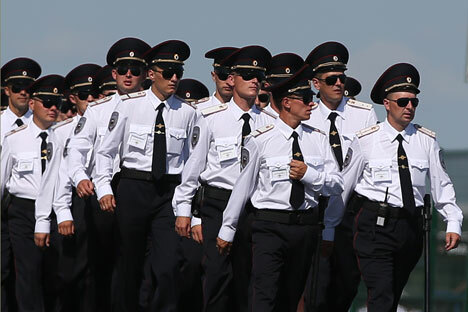 A series of proposed amendments to the law that would see Russia’s police awarded additional powers to search and fire on suspects has caused a stir in Russian society, with a number of prominent human rights figures stepping forward to criticize the initiative. The amendment project to the "On Police" law was introduced in the Russian parliament, the State Duma, on July 1, shortly before deputies went on summer recess (on July 3). The authors are a group of deputies headed by Chairwoman of the Security Committee Irina Yarovaya. Due to the summer break the Duma has chosen to postpone reviewing the bill until parliament convenes again in the fall. However, the proposed amendments are already sparking controversy, with reactions from public figures ranging from support to harsh criticism. A number of the proposed amendments envisage the extension of policemen's rights. While at present policemen are prohibited by law from shooting at women in general, if the amendments are adopted it will be illegal to shoot only at only pregnant women. They will also be allowed to use firearms in crowded places in case of a necessity to prevent a terrorist act or the taking of hostages. The new amendments would also give policemen the right to search citizens based on personal suspicions (without search documents), as well as open vehicles without the owners' consent. The amendments also propose to exempt policemen from any persecution for acts carried out while on duty if these acts do not violate the law. On the other hand, the bill also contains articles that impose additional responsibilities on the police. The new version of the law would require policemen not only to administer first aid and send the injured party to the hospital (as is presently the case), but also inform his relatives about the incident within 24 hours. As soon as the bill's text became accessible, a series of public figures expressed concern that the extension of police authority could lead to an increase in violations of human rights, with activists especially anxious about the amendment on allowing policemen to shoot at women and in crowded places. Russia’s human rights ombudswoman Ella Pamfilova called on independent experts to review the amendments. "The way in which the bill is presented now is very dangerous, it can lead to additional brutality," the TASS news agency cites Pamfilova as saying. Sergei Babinets, human rights activist and expert at the Committee Against Torture, agrees with Pamfilova. He sees the amendments as a move by the government to authorize the forceful suppression of possible protests. "If the socio-economic situation continues to deteriorate, people may become indignant, something that may lead to protests, and it is with these amendments that the government is trying to prepare itself," Babinets told the Kommersant business daily. …or a guarantee of protection? The deputies who developed the bill say its objective is to guarantee citizens their security, including that of policemen, who often die or are wounded on duty. According to statistics provided by the Russian Interior Ministry, 202 policemen and Interior Ministry servicemen died on duty and 1,945 employees were wounded in 2014, while this year 33 policemen and servicemen died on duty and 842 received various injuries. Yevgeny Chernousov, a lawyer and retired police colonel, believes that in the context of the present situation, when the threat of terrorist acts is growing, such amendments are justified. "It is necessary to allow policemen to use weapons in order to prevent terrorist acts and attacks on colleagues. And terrorist acts and attacks are also carried out by women. If a ‘black widow’ is about to blow herself up, policemen must be allowed to prevent this." “Regular policemen will not fire on crowds. This police psychology has existed since the Soviet times: He will think 10 times before using his weapon, since if anything happens, he will be held accountable," he said. Read more: Russia comes in third at World Police and Fire Games in U.S.